Being Retro: Pierce Brosnan Double O' Severed if He were a ZOMBIE! 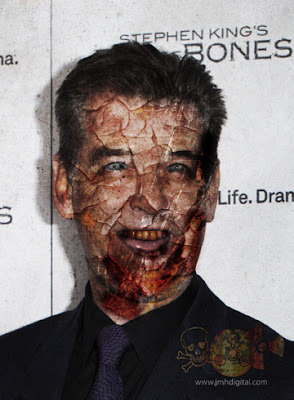 Pierce Brosnan Double O' Severed if He were a ZOMBIE! Here we are in the last week before the big Christmas Day, what are your plans? What special things do you do? Traditions? Movie Choices? Quick review of "Bag of Bones" I enjoyed it, it wasn't as creepy as the previews made it out to be. I thought it fits the same pattern of writing that Stephen King likes to make his films into, I was not disappointed. We here at the Zombie Homestead find ourselves getting Chinese food on Christmas Eve and this year a talk of seeing "War Horse" on the day. We do snacks for Christmas Eve and either Chinese or Thai New year's Eve. I saw a movie this weekend that you might dig. Rare Imports. It's Swedish and about these people digging up Santa, only he's a demon. Really weird but very creepy and unique. Sorry, that's Rare Exports. Got my shipping directions confused!